A newly elected president must deal with a crisis that challenges his administration's agenda and changes the course of the nation. Full of insider information, this political thriller paints a believable picture of Washington's corridors of power with an alarming ring of truth. Ellen Vaughn is an award-winning author and speaker. 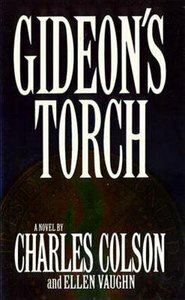 Her novels include The Strand and Gideon's Torch, which she coauthored with Chuck Colson. She collaborated with Colson on eight other nonfiction works, including Being the Body, The Body, and Kingdoms in Conflict. Her most recent book is Radical Gratitude. Vaughn speaks frequently at Christian conferences and has been featured at writers' seminars in the United States and Canada. She lives in Virginia with her husband, Lee; daughter, Emily; twins, Walker and Haley; and an enormous dog named after C. S. Lewis.